Is President Obama planning his schedule around the Deeth Blog? It can't be a mere coincidence that he visits Bettendorf the same day that District Of The Day does. The winner was Roby Smith, who had lost a 2006 House race one district to the west. The primary with Hartsuch was more a matter of emphasis than actual policy differences; Hartsuch was about social issues especially Teh Gay while Smith was about Business. Democrats were optimistic enough that they, too, had a primary. Phyllis Thede's husband David was favored, but lost a bit of an upset to Richard Clewell. In retrospect, Democratic hopes to win this seat probably vanished when Hartsuch lost the primary, as Smith handily won the general with 59%. David Thede's Senate primary loss last year precluded the chance that Iowa would see its first husband and wife legislative team since the Republican Hesters (Senator Jack and Representative Joan) left office in 1994. As noted, Phyllis had run for the Senate seat in 2006, falling just 436 votes short of Hartsuch. In 2008 she set her sights on the House and finished off another two-candidate family, the Van Fossens. Jim, the dad, had lost to Elesha Gayman in 2006. Phyllis beat beat Jamie Van Fossen, the son, 56-44. Republicans made a serious comeback effort in 2010 with former Davenport city council member Carla Batchelor, but Thede held on by 233 votes. Given that margin, the line changes are significant, as Thede loses more than half of what had been an 1145 Democratic registration edge. Thede's district shifts east, losing part of downtown Davenport and everything north of 53rd Street, and picking up a bigger piece of west Bettendorf. 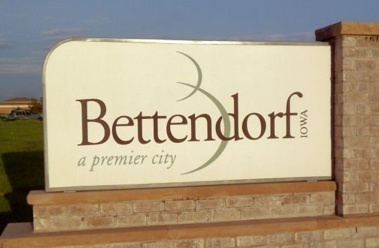 The Republican primary doesn't always settle things in Bettendorf. After Linda Miller knocked off moderate Joe Hutter in the same 2006 primary where Hartsuch teabagged Tinsman, Hutter continued his re-election bid as an independent. Democrats didn't have a horse in that race, which Miller won easily. She went unopposed in 2008 and 2010. This is still basically the Bettendorf district, though a slightly bigger piece gets carved out; at 33,217 population, Bettendorf is just a little too big for The District Draws Itself. Miller picks up the northwest part of Davenport from Thede, and Pleasant Valley Township east of the city limits. This gives her a slightly stronger GOP registration edge.